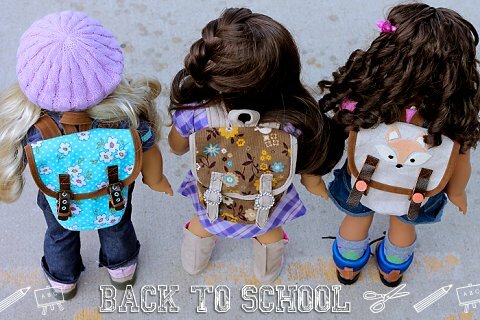 Are you ready to get started on your doll pack? We’ll begin with cutting out the pieces. If you haven’t downloaded the free backpack pattern, you can do so here. Notes for Newbies: If you are new to sewing, you may want to try this out with some scrap fabric first, just to take a trial run at the pattern. You’ll feel a lot less nervous when you cut into your nicer fabric. A trial run project made with scrap fabric is called a muslin. I like to use old sheets from the thrift store for muslins. 1. Cut the backpack pieces from your fabric. From the fabric you’ve chosen for the body of the backpack, you’ll need to cut 1 Top Flap, 1 Base, 1 Outside Pocket, and two rectangles, each measuring 5.25″ x 5.75″. The shorter 5.25″ sides of the rectangles will be the side seams of the backpack, so if your fabric has a directional print, be sure to cut so that the print is right side up. Mark on the Top Flap piece and the Outside Pocket piece where the closure straps will be attached. The proper placements are marked on your pattern by a box with an x in the center. If your fabric is lightweight, like quilter’s cotton, you should back your cut pieces with a medium weight interfacing. This will give your finished backpack a little more body and it will hold it’s shape. I didn’t interface the pack I made with baby wale corduroy, but I did use interfacing on the packs I made with flannel and linen. I used an iron-on interfacing. 2. Cut the Shoulder Straps and Top Loop. The measurements for these three pieces are on the pattern. I used faux leather for 2 of the packs and suedecloth for another. Any woven fabric should be fine. A quilter’s cotton in a small-scale print would be fun! No need to interface these pieces. 3. Cut the Trim for the Pack Openings, Outside Pocket, and Top Flap. The measurements for the four trim pieces are on the pattern. I used faux leather and suedecloth, but any light to medium weight woven will work. You could also use packaged bias tape. You can make the straps with a woven fabric as I did for Avery’s backpack, in which case you will cut the measurements as given on the pattern. You will be folding and sewing the straps to be 0.5″ wide when finished. OR – you can cut the straps from pieces of leather, as I did for Caroline’s backpack (pictured at the top of this post). Cut two straps 3″ x 0.5″ and two straps 4.5″ x 0.5″. No folding and sewing will be necessary, these will be used “as-is”. OR – you can use packaged 0.5″ wide double-fold bias tape. Cut two straps 3″ x width of pre-folded bias tape (0.5″) and two straps 4.5″ x width of pre-folded bias tape. The tape is pre-folded to be 0.5″ wide, but you will sew the open edge closed to finish the straps. 5. [Optional Step] Applique the Top Flap. If you are going to embellish the Top Flap, now is the time to do it! I used a fox applique. If you’d like to get the free fox applique pattern, please sign up for my newsletter. Of course you could make up your own design, too! Wool felt or craft felt scraps are good to use for applique since the edges will not fray. I used double stick fusible web (Steam-A-Seam 2 is a good choice) to fuse the pieces of the design to the flap with my iron. It’s super easy! You could also sew on the applique either by machine or by hand. We’re just about ready to start sewing! Please let me know if you have any questions about cutting out the pattern pieces or if anything above is unclear. This entry was posted in Doll Sew-Along, Doll Sewing, Free Doll Patterns and Tutorials and tagged 18" Dolls, American Girl Dolls, Free Doll Pattern, Sew-Along, Sewing for Dolls. The Backpack Pattern is Ready! Avery’s New Backpack and Free Pattern Sneak Peek! Paola Reina Liu. And Liu’s Shoes. Fun Dog.. ahem.. DOLL Find! MSF - Email Addition! SIGN UP HEREto have every new blog post sent directly to your email address. Hi! I'm Stephanie, and yes, I still play with dolls! I love to design patterns, sew, craft, and photograph my collection. Most of my dolls are American Girl, but I'm also really enjoying Les Cheries, Paola Reina, Maplelea, and Hearts for Hearts dolls. My hope is to inspire you to enjoy your dolls, too, and get the most out of your collection every day! More about me (and this site)..
ManySmallFriends.com is in no way affiliated or associated with American Girl™, Maplelea™, Corolle™, Paola Reina™, Playmates™, or any other manufacturer. All opinions are my own.